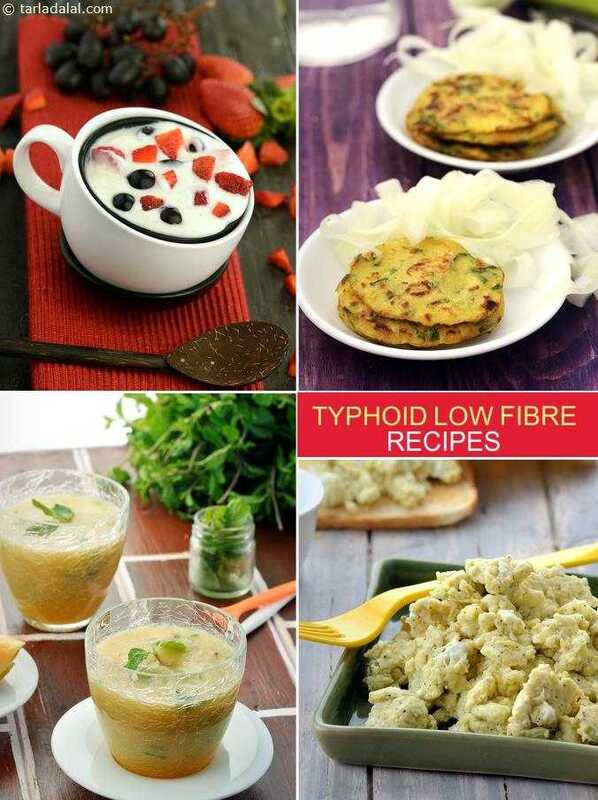 It is better for typhoid patients to stick to a low-fibre diet if they suffer from diarrhoea. Try to avoid high-fibre foods like whole grain cereals and whole pulses as it will worsen your diarrhoea. Eat only fresh foods that have been cooked well. Raw foods like salads can irritate your system. Say no to spicy and oily foods, mithais, chocolates, aerated drinks, tea, coffee, pickles and processed foods. Milk must also be avoided if you have diarrhoea. Curd can be consumed as it is light on the stomach and contains good bacteria. Including dahi in your diet will restore your gut bacteria. You can jazz up your curds a bit and enjoy a raita like the Strawberry and Black Grape Raita. Bland, low-fibre foods like Rice Porridge and Cucumber Pancakes are easy on the stomach and can be comfortably included in your diet. You can include eggs only if tolerated – try having a small quantity first and gradually increase it.